The Greenline Hybrid hides a lot of technology behind those sleek lines. In February, I attended the Miami Boat Show – along with thousands others. In between appointments and rain showers, I spotted a brand name I hadn’t seen before: Greenline. The boat didn’t look that different from the dock. She had a cream hull and beautiful lines, but a lot of vessels did at the show. It’s when I got onboard that the differences were obvious. Her technology had been streamlined to make hybrid power accessible and easy for any owner. In addition, there were small details such as QR codes linked to the correct chapter of the owner’s manual. Fortunately when I reached out to Jim Meigs at Popular Mechanics, he agreed, and in March, Popular Mechanics featured Greenline on its website. Read the article here. 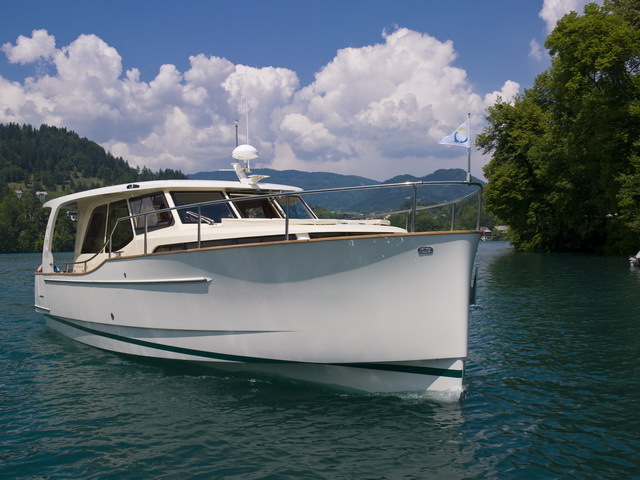 This entry was posted in Uncategorized and tagged behind the story, greenline hybrid, miami boat show, popular mechanics. Bookmark the permalink.